A bold fantasy in the tradition of Roger Zelazny's Chronicles of Amber, The Merchant Princes is a sweeping new series from the hottest new writer in science fiction!Miriam Beckstein is happy in her life. She's a successful reporter for a hi-tech magazine in Boston, making good money doing what she loves. When her researcher brings her iron-clad evidence of a money-laundering scheme, Miriam thinks she's found the story of the year. But when she takes it to her editor, she's fired on the spot and gets a death threat from the criminals she has uncovered.Before the day is over, she's received a locket left by the mother she never knew-the mother who was murdered when she was an infant. Within is a knotwork pattern, which has a hypnotic effect on her. 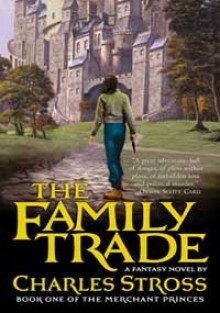 Before she knows it, she's transported herself to a parallel Earth, a world where knights on horseback chase their prey with automatic weapons, and where world-skipping assassins lurk just on the other side of reality - a world where her true family runs things.The six families of the Clan rule the kingdom of Gruinmarkt from behind the scenes, a mixture of nobility and criminal conspirators whose power to walk between the worlds makes them rich in both. Braids of family loyalty and intermarriage provide a fragile guarantee of peace, but a recently-ended civil war has left the families shaken and suspicious.Taken in by her mother's people, she becomes the star of the story of the century-as Cinderella without a fairy godmother. As her mother's heir, Miriam is hailed as the prodigal countess Helge Thorold-Hjorth, and feted and feasted. Caught up in schemes and plots centuries in the making, Miriam is surrounded by unlikely allies, forbidden loves, lethal contraband, and, most dangerous of all, her family. Her unexpected return will supercede the claims of other clan members to her mother's fortune and power, and whoever killed her mother will be happy to see her dead, too.Behind all this lie deeper secrets still, which threaten everyone and everything she has ever known. Patterns of deception and interlocking lies, as intricate as the knotwork between the universes. But Miriam is no one's pawn, and is determined to conquer her new home on her own terms.Blending the creativity and humor of Roger Zelazny, the adventure of H. Beam Piper and Philip Jose Farmer, and the rigor and scope of a science-fiction writer on the grandest scale, Charles Stross has set a new standard for fantasy epics. i think this suffered from my expectations of a charles stross book. took me forever to get through because i kept being distracted by other books (including books by stross that i absolutely love).